I am looking back a little here, less than two months to be exact which is fairly short-term for historians! 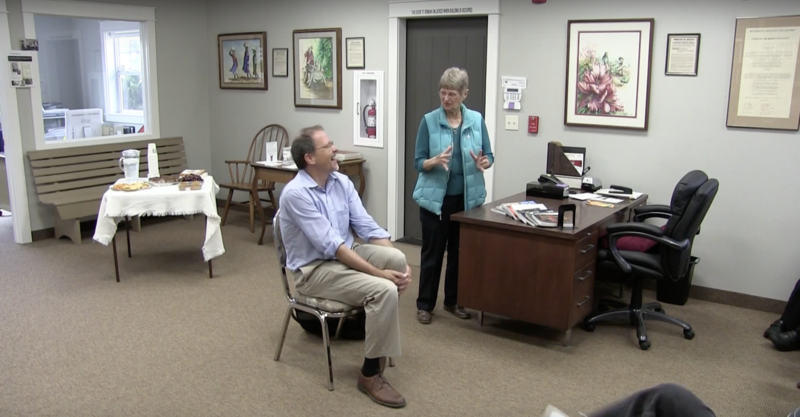 I am remembering a Saturday afternoon in September with Dr. John D. Roth director of the Institute for study of Global Anabaptism was guest at the Kropf Heritage Center to introduce us to that work and emphasis. The remarkable awareness for us is that Anabaptism is larger in the southern hemisphere (81%) than the northern, Europe and North America (19%). This is the work of Mennonite World Conference which gathers in all denominations, conferences, groups who find their theological roots in the 1525 radical reformation of the church in Europe. Dr. Roth first told his own background and a “found” interest in history, and then Anabaptist church history. John Roth feels the call as a scholar to make this information and material available to the rest of us. He told stories of this growth in Latin America, Asia and Africa, stories that encourage our faith who live north of the equator. Beyond the global stories we heard of John’s work on behalf of Mennonite World Conference for inter-denominational connections. I really cannot retell John’s presentation for any satisfaction as when hearing his own voice as he presented that afternoon to gathered group, casual and interactive. Here is the link where you also may catch the passion of Dr. Roth’s work to study global Anabaptism on behalf all of us for our benefit.